Slotted spoons are perfect for retrieving foods straight from the pot while preserving flavorful cooking liquid. Scoop up tender marinated vegetables with this basic yet functional 15" slotted basting spoon. Made of smooth 18/8 stainless steel, this spoon will hold light or heavy dishes and designate perfect portions. It is engineered to be lightweight and more graspable than ordinary handle bases, and the convenient built-in notch will keep this spoon close at hand, preventing it from sliding into the pan. This is a nice long slotted spoon. It would be perfect for a variety of uses and is long enough for stirring large pots of chili. I love everything about this spoon. It is ergonomic, a hard to believe price, and so comfortable to hold. It doesn't cut into your palms when lifting heavy things with it. The 15" Standard Duty Slotted Stainless Steel Basting Spoon is a great product. It is so affordable and so useful! I am definitely going to order more. Love this spoon! Good quality and construction. Great for stirring/mixing big batches. Could be used in buffet lines too but not ideal. Thank you for another great product! Three things caught my eye when shopping for metal cookware: 1) sturdy design that won't easy bend under typical forces induced by cooking, 2) inexpensive price with options for purchasing in bulk, and 3) no designs that require extra time to clean around. Very effective piece of equipment to have in my kitchen. Would recommend! Not necessary for very small pots but definitely awesome for the larger ones. Love to use this product with all different types of food. Since it is so large my hand never burns. Great! My favorite slotted spoon in the kitchen. Love the length for use with steam pans. Such a simple design and at this cost the best slotted spoon around. I am very pleased with this product! This spoon is great quality and has some weight to it. You cannot beat the price either. I am a huge fan of the hole at the end that allows me to hang it from an s hook for easy accessibility. Sturdy solid spoon, recommended for cold application as it does not have a handle. Otherwise, good product for an affordable price, spoon is exactly as described. This stainless steel spoon is slotted and features an extra long handle measuring 15 inches, allowing you to reach inside some of your deepest pots and easily serve food even at the end of service. These are very durable products for a great price. I absolutely love that I was able to purchase this item at this price! I wasn't expecting to receive an item that was as sturdy as this and, I saved a bunch of money. This is the perfect item to remove vegetables from a large pot. The 15" standard duty slotted stainless steel basting spoon is a great addition to our buffet line. The slotted spoon is perfect for draining of vegetables before platting them. The 15" Standard Duty Slotted Stainless Steel Basting Spoon works great for serving size dishes. The quality is excellent, like something that you may find in a restaurant kitchen. This spoon is definitely a great value and I highly recommend. I had originally planned on using this as a serving spoon for green beans but I have found so many uses!! I love that the length can fit my tall stock pot!! I love this spoon. The handle is long enough that you can reach into a tall pan without burning yourself. It is very sturdy. Great quality material and super easy to wash.
This15" Standard duty slotted stainless steel basting spoon works great. I have no complaints and i'm sure it will last a long time. Worth the money. These spoonss area perfect for cooking. They are not the heaviest weight, but you can't beat the price, and they serve their purpose really well. This is a great value on these slotted spoons. They are light weight and easy to use. It helps drain juices from foods. They are easy to clean. Perfect spoons for those deep stock pots. They are easy to manage and makes stirring a lot more tolerable. I will get more to add to what I have in stock already. Multi use spoon that has come in handy. Very easy to clean and is very durable. Great for everyday use and easy to store and get out of the way. This is a very nice slotted spoon. The handle is long enough that you can reach into a tall pan without worrying about burning your arm. It is sturdy enough to stir a large quantity of stew or soup and easy enough to drain off some of the liquid if you want to. The spoon fits very nicely on our hooks so it is handy to grab when you are in a hurry. The weight is very nice and feels great in the hand. We keep the matching solid spoon and the slotted spoon side by side so we can save a trip and take both to the stove at the same time. You can always use more spoons, right? This is a spoon. It is a good spoon. You will use it a lot. Would recommend to others. I really like this basting spoon because of its long handle. Bought specifically for the taller pots and it works great. It is of good material and light weight. I have this along with the perforated and solid basing spoon. What not put the best in my home as I would in my restaurant. Thank you for being able to ship to residential addresses. You can use the 15" Slotted Basting Spoon to serve pinto beans without much of the juices to guests and or loved ones. Some people don't care much for the liquid. It fit well in my 930 pressure canner. Fit well in my hands. Really long so fits in big containers. Nice slotted spoon perfect for ravioli. The handle is a bit long, but it does the trick and it seems to be pretty nice quality. It should last me a long time. This is a great spoon for cooking and for serving!! Long handle and the perfect size for serving those delicious vegetables that need the liquid left behind! Losing my spoons in a full stockpot is now a thing of the past!!! Great item, perfect size for any task. Cleans easily and looks great! Great Basting spoon. I love the extra long handle for sauces in deep pots. It is very easy to clean, either in the dishwasher, or by hand. I would highly recommend. Thie slotted spoon is great with its long handle and wonderful construction. Pricing of course the best to be found. Tell all my partners where to buy great products at excellent prices. Nice, cheap slotted spoon for serving items submerged in liquid. Great for condiments, greens, meat balls, etc. The built is not the sturdiest ever, but I suspect with normal wear and tear that it will hold up for many years. Quality is excellent at this price point. 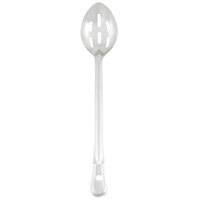 Ideal for pasta and soups, this spoon looks good and is heavy enough for most uses in our kitchen. we really needed a long handle slotted spoon for our bulk soups. and this was a great choice. very strong and easy to hold. for the price you cant go wrong. This 15" standard duty slotted stainless steel spoon is a very well made and durable spoon. The length is good for large pots. We have ordered several for our restaurant. At this price, you can order many of these. VERY poor quality spoon. Super thin and will bend very easy. No way this is holding up to every day, or even one day use. Would send them back and get better grade, but they want me to pay shipping and restocking fee, so buyer beware of this grade utensil. Thank you for your review! We're sorry to hear that this spoon did not meet your expectations. These are an excellent value perfect for use with light-weight foods. If you are looking for a more durable alternative, try the 15" Vollrath Jacob's Pride 64406 solid stainless spoon which is ideal for heavy-duty use. I always purchase my large serving spoons from this website. But This one is a little too long I will stick with 13 inch spoons. But this one would be good for soup I guess. Great quality! What a wonderful tool! This stainless steel 15 inch slotted spoon works great for cooking pasta and even blanching fresh vegetables! An unbeatable price makes this a must buy!! !